It is obvious that Mr. David Miscavige is doing his best to ensure the survival of Scientology. He should be given medal of herculean efforts. These ideal orgs are a boon for the nation. A nation is as alive as it can dream and these orgs will certainly help people in achieving their dreams. Mr. Miscavige works hard to help Scientology and Scientologists flourish and prosper. Can I get a gage here on what the critics here are trying to accomplish. I spoke with @failroot. nice guy. he supports peoples freedom of religion and what works for them but thinks the church leadership and its structure should be questioned. how many agree with that and that is their sole purpose here? and who support just demolishing scientology? I just think we should get to the point here instead of the mindless arguing. lets try to get on level here. Hi, Andy! Other than you and I, this site isn’t very active so I’m not sure if you’ll get the answer that your excellent question deserves. And, before too long our conversation will likely be deleted, sadly. You might get a good perspective on your question, you may want to Google the words “freezone scientology”. It’s a large and growing group of practicing scientologists who atill practice their faith but are openly critical of church management. They have exactly the perspective you’re looking for. There are many such groups and I think you’d be interested in what they have to say. if I may ask a personal question; many of my friends were given antidepressants by the VA, and had varying levels of success. Did the VA ever try trearing you with antidepressants and, if so, did you take them? I was treated with various psychotopics to include mood stabilizers, antidepressants and anxiety medications tried so many of them.. all were taken for 6 months to a year at a time over a ten year period. I had some “improvements” but it wasn’t real, it didn’t last and I could still be found in a corner crying my mind out time to time. in fact the crying spells were far more intense. As time went on I became increasing suicidal. the thoughts became more intense (all while on medications). Then one day I got into a confrontation with a man an broke his door down to get to him. I was arrest and faced up to 10 years of prison time. (while on medications) I was released but ordered to go through a program. at that point I got off the meds and slipped into heavy drug use (like many vets) and then went back on meds. a few months later I attempted suicide, the cops were called and they broke in the door and tazed me as I was cutting my wrist open. Once I regained my sanity in the hospital I vowed to never take medications again no matter how bad I felt as I was likely to end up in prison or kill myself. I have a problem here. Im a web designer and I tend to juge a book by its cover. The free zone web sites look all very Mickey mouse I mean a web site doesn’t have to be all flashy but it should at least be taken serious enough to look presentable. At this moment in time I am as likely to take the freezoners as serious as I am to take a bible study in a crack house. I’m beyond glad that you found somerhing that works for you, Andy! but plwase tell me- those that had a different experience, where they credit medication with helping them recover from the horrors of war or overcome depression that they couldn’t ahake otherwise; are their perceptions as valid as your own? Andy, do you know what Hubbard called people who whad ab extensive paychiatric history, including heavy drugs, and someone who is an ex-member of a federal agency like the department of the army? His word for you, based on your history, is an “Illegal PC”, which means illegal pre-clear. According to his written policy in HCOB 6 Dec 76RB, case supervisors are not allowed to process you. It is policy that they cannot and must not “handle” you like someone who has not had those experiences. Ironic since Hubbard died with psych drugs in his system, no? Also, according to Flag Order 2712, dated 28 jan 1971, they will not allow you to join the sea org. No loss there, but you might not have known what you were excluded from. Personally, I would like to see scientology reformed or improved, not destroyed. I know many scientologists, and I like each one. And many of them feel the same way. Some of them would like to be able to practice independently, but they’re not allowed to. Isn’t that odd? They want to study Hubbard’s words and do the things that he showed them how to do (through his writings), but they’re not allowed to. Those that try are threatened with lawsuits or called names, and their friends turn their backs on them. What other church doesn’t allow people to call themselves a believer, even if they’re not in the “official” church? How many Catholics have been sued for starting their own church? How many Christians have been called names because they want to read the bible on their own and follow their own path? I have nothing against scientologists, and want to see each one prosper. However, I have concerns with the management of the church and THAT’S what I criticize. I will never attack a scientologist or their beliefs, merely point out things that I think don’t make sense or should be explored. Here’s an example- click on my username; you can see examples of how the official scientology outlets (including this one) spread false information in the form of doctored images. This isn’t the first time, either- this happened at an IAS event in 1999, and it was much more obvious then. You can see in my link the actual photographs that show their numbers to be false. Shouldn’t we criticize the practice of LYING to people? Absolutely. So, can you please stop forwarding lies? Afraid I can’t stop something I never started, Louanne. I have studies, surveys and censuses to back up my conclusion, plus I happen to travel a lot and happen to see how many orgs across the country are consistently empty. Upon what do you base YOUR conclusion? Do you have anything more than what you’re told from management? Scientology is shrinking, and only the scientology resources claim otherwise. Only by acknowledging the fact can you hope to reverse it. Bah, would you stop circle-jerking, please? It’s disgusting. I believe what I see. I living in California I can tell from personal observation for the last 10 years: Scientology membership is growing, not only the number of churches but also the number of the people in it. That’s odd, because I was just in Philadelphia. The org there was empty all week. So all you can claim (and we’ll assume you’re correct, for argument’s sake) is that the area NEAR YOU is “growing”. You can’t personally attest to anything else. So where do you get your belief that scientology as a whole is growing? You choose to ignore every study and survey that’s shows otherwise, so what do you base your conclusion on? Is it safe to say that you being a critic of scientology don’t read well? what lie are you referring to? if youre talking about the reference to the ontario org, his statement was factual- it is boarded up, is it not? read what he wrote again and you would see. but he seems to have drawn an inference that is incorrect; the org is not permanantly closed. He didnt say anything beyond the point that it was boarded up; you and I assume that he meant something, but we don’t know for sure. So for you to call it a lie is inaccurate. your turn, how do you feel about the false statements by pat and louanne? As I also said, the old org may be boarded up but the Church moved so IT is not boarded up. Now you’re playing with semantics. What he said WAS a lie. The org was not boarded up. Just a building that is not the org is boarded up. It was intentionally misleading propaganda which you are defending making you guilty of lying by association. My post, again, disappeared. Odd. Let’s discuss the difference between denotative and connotative meanings. The denotative meaning is very literal; in this case, the building that housed the church is boarded up, perhaps for renovation (as from the official release). This may be true, or it might not reopen. But what Ulysses said is technically factual (ie, not a lie). Now, there’s a certain connotative meaning behind the phrase “boarded up”, isn’t there? It often implies closed forever. Is that what Ulysses meant? Maybe; likely even. But he hasn’t addressed that, so we’re all operating on assumptions and guesses. But let’s imagine that he did mean that it’s closed forever. Did he intend to deceive? Maybe- if so, that’s a lie. Was he incorrect? Maybe- if so, that’s not a lie. You don’t know which it is, do you? Instead, you’ve reached a conclusion based on insufficient information and stated something as fact, even though you can’t know for sure. Do you do that a lot? I wonder if you hold yourself to the same standard that you hold others? You call Ulysses a liar for his statement on the Ontario org… what are you, then, for your non-factual statements that scientology was “pulled out” of the Aris 2008 report? As I said before FAIL, the building that was boarded up was not the org. The org itself had moved. So it WAS a lie to say the org was boarded up which is what he said. pat; kindly provide evidence of intent to deceive, without which it is not a lie. As I doubt you have that information, it appears you’re drawing a conclusion with insufficient evidence. frankly, it seems to be a difference in phrasing. But you’re free to focus on what you want. In the meantime, I suggest you direct your questions to the person who made the comment. According to the Scientology News Australia webpage, Vicki Dunstan is the President of Scientology. Is she also the head of Public Affairs like she claims in the article? My; they certainly must be hard up for volunteers if the president needs to pull double-duty as the head of public affairs! I’d imagine that those would be full time jobs in and of themselves if there weren’t so few scientologists in australia. Now those Jedi- they’d certainly need to have the positions seperate- if memory serves, they outnumber scientologists 30 to 1. Is this the same Vicki Dunstan whose daughter called scientology a “toxic church”? Yes, there are thirty times more jedi in Australia than scientologists. The last census (in which they DO ask the “religion” question) found 65,000 jedi and only a couple thousand scientologists. There’s also more witches in Australia than scientologists- over 8,000 of them. This is also incorrect. The margin of error is quite reasonable for large religions. Only those that are small (and lumped into the “new and other” category) had a high margin of error. The margin of error itself is further evidence of the small number of self-professed scientologists. If you don’t believe me, ask the study’s authors. You can see all of the Ideal Org videos on the new YouTube Channel. They are made before the parish moves in. It should have been obvious, that these were pre-move in, since it was that way in all the videos. PS, why do you keep saying you have “millions” of members when the ARIS found only 25,000 in the US and the Australian Census found less than 2300? Because the ARIS study was a fake. The year after they had to take it out of their reports because it was unscientific and unreliable. I am aware that the usual suckers don’t feel disturb by false information and still keep repeating it. Here’s the link for you on that. Louanne is right, your cronies continue to perpetuate a lie and suckered you in, or you’re part of the disinformation campaign. There are approximately 15 million Jews in the world; so if there “millions” of Scientologists as according to you, there should be at least 2 Scientologists for every 15 Jews. Therefore, there should be AT LEAST 2 Scientology orgs for every 15 Jewish synagogues (“at least” because I know Scientology is more about 1-on-1 spiritual counselling rather than big Congregational sermons and such). Just from a cursory glance at Google Maps, there are maybe 50-60 synagogues within 100 miles of me, so therefore according to you, there should be 8 or so Scientology orgs. There is 1 (O-N-E) Scientology center within 100 miles of me. It’s not even an “org;” it’s a mission, and it recently shrunk from a 2 story building to a 1 story building. Your own church’s website pulls up only a couple of dozen locations around the world. Many of these places are dead. You do NOT have millions of members; do NOT accuse me of spreading disinformation. Actually, Ulysses, a quick search of this site shows that Pat, at least, claimed 10 Million members as of 2007 (“So much happening!”, posted originally by Louanne. Comment by Pat on March 7, 2011 12:43 am). As I think they’re claiming “exponential growth”, we should expect to see a nearly one for one match of jews and scientologists. Like you, I see a lot more synagogues than scientology centers. Interestingly, fairly recently I traveled past both a synagogue and a scientology org. The synagogue was quite busy and active while the org was staffed by a desperate looking man and a frumpy woman. I kept walking, like everybody else. But, anyways, assuming NO growth since the last numbers, we should see 1 scientology org for every 3 synagogues, which is far from reality. For that matter, it should be common to meet scientologists in social settings or away from orgs, nearly as common as meeting jews. It is not. Heck, it should be common to see scientologists represented in politics, the military and science, at least as third as many as jews. It is not. As an interesting comparison, 187 jews have been awarded the nobel prize. Do you know how many scientologists have been awarded the nobel prize? If you guessed 62, you’re wrong- zero. none. Despite their “increased IQ”, not a single scientologist was earned the nobel prize. How wonderful! I thought Scientology in Canada was dead after Narconon Trois Rivieres in Quebec was shut down and the Toronto Org was boarded up! Check it out, there’s great video of the opening online as well! Toronto org is at 77 Peter Street while the other is renovated. Your video isn’t about the opening at all. Just a protest. What? A anti-scio lying? NO! Say it isn’t so! Friend just visit the temporary location in toronto… says its rather nice there too! 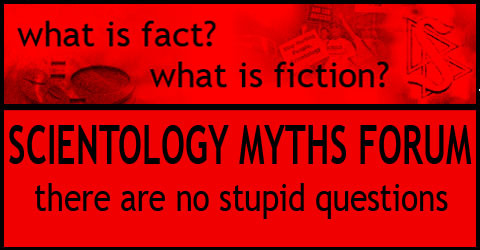 ScientologyMyths.info Update: The “Int Ranch” “Stop vilifying Scientology” Well said!